Are you tired of the nagging that is going on in your home? Tired of asking over and over again for something to be done, only to feel like you need to yell for your kids to listen? I don’t know about you, but there have been many times that I have felt helpless, and powerless when my boys don’t listen. I found myself asking over and over for them to get stuff done. The first request was always kind and calm, followed by a slow escalation in voice and impatience with each additional request. Before I knew it, I was mad, they were mad and we both were left feeling frustrated. I kept having the impression to pull out a book called Parenting: A House United. One night, I finally pulled it out and I am so glad I did. I opened it up to where my bookmark was and I started to read. There was a small section on nagging that really opened my eyes. Although this section was small, it rang loud in my ears. This blog post is going to focus on what helped me stop the constant nagging in our home. I have found myself remaining calm more often because now I know how to handle the situation. My boys are learning fast! They are understanding that it is better for them to listen the first time and to get the job done first to prevent further chores. I don’t have to yell or get angry and the job gets done. IT IS A BEAUTIFUL THING! This family meeting is key! If your child understands what you are doing and your goal as a family, then they are more likely to follow it. During this meeting talk with your family your concerns about nagging and how you have to ask multiple times for things to get done. Allow your kids to voice their opinions and ask for ideas of how they can help be a part of the solution to stop the nagging. Discuss with your family that if they do not follow through with what is asked of them the FIRST TIME, they will receive a consequence. Talk with your kids about what that consequence should be. For us, an extra chore is what my boys chose and works really well. Go over the fact that, just like in real life, criminals don’t get to choose their consequence. Everyone has the freedom to choose, and there is either a good or bad consequence attached to every decision they make. When a bad choice is made, a consequence will be chosen for them. When you ask, “Jon, could you set the table please?” be prepared for a yes or even a no answer. However, if you word it as, “Jon, set the table please.”. It is still kind, but you asking in a way that you expect him to follow through. This part is so important! When you are giving instructions call your child by name and make eye contact. This eliminates any excuse of, “I didn’t hear you!”. HA HA Right? How many times have we heard that? Make eye contact and when you are done giving instructions ask, “Do you understand?”. They either say yes, and then follow through or they say no in which you repeat the instructions until they do understand. This is where I would start asking again and again for them to complete whatever it was I asked them to do. By doing this you are teaching your child that it’s ok to no listen to the first time. They are being trained to not follow through until you are red in the face and threats are being thrown all around. However, this can be simple and your kids will catch on fast. Once they do not follow through the FIRST TIME with your instructions, calmly say, “Jon, I asked you once to come and set the table but you chose not to listen. After you set the table you have another chore to do.”. This is SOOO important! If your kid receives more chores, remember and follow through. There have been times that my boys were really hard pressed to listen one day and I had 2 of them get 4 extra jobs each. They soon realized that if they kept behaving that way, they would be receiving a lot of chores. What would have ended in yelling and frustration before, ended with my boys finishing their jobs while I was able to remain calm. There is no reason for you to get upset. You job is to help them understand that every choice comes with a consequence (whether good or bad). You are their guide as they practice learning in your home, so they can be ready to enter with confidence in the real world. How you react and your reaction to their decisions will have a lasting impact on them as well. Once your child is finished carrying out your instructions or extra chore, have them come to you to let you know they are done. It is also very important that you check their work. Praise them if its done well, or have them do it again with additional instruction if it was poorly done. If your child listened the first time, reiterate that they made a good choice and praise them for their efforts. 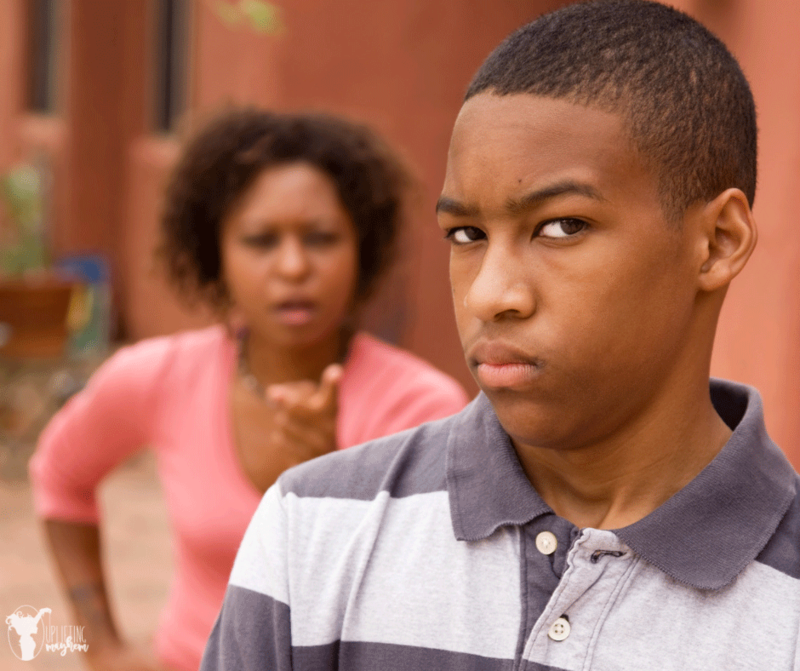 When your child receives more chores for unruly behavior, after their chores are complete, sit down with them and discuss what happened. Go through the scenario again and help them to think of a different way they could have handled the situation. 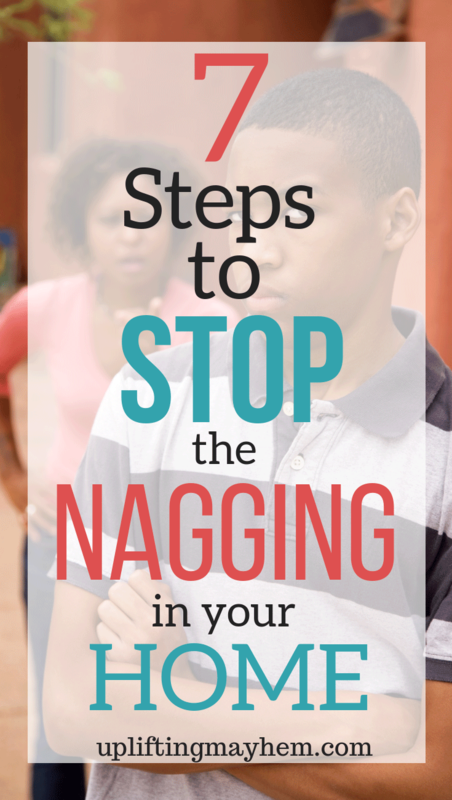 I hope these steps help you to stop the nagging in your home. It has helped my husband and I so much in teaching our boys to listen the first time.